It does not look pretty, but it tastes amazing! Homesick Texan doesn’t disappoint. This recipe makes both J and I miss Texas sweet 1015 onions terribly. Vidalia onions are good substitutes, but don’t quite have the flavor. Since we can’t find the onions in Mid-Missouri, we had to make a few changes to the recipe, but it still turned out quite well. 2 pounds of your favorite sweet yellow onions if you can’t find Texas sweet 1015 onions. Vidalia onions are a pretty good substitute. In a large skillet (the original recipe called for cast iron, sadly, ours is a bit too small, so we use the largest skillet we have and then a casserole pan) on low heat melt the butter. Add the chopped onion and while occasionally stirring cook for 10 minutes until soft. Don’t try to caramelize. Stir together the cooked rice, cumin, allspice, cayenne, garlic, chipotle chile, sour cream and 1/2 cup of the Gruyere cheese. Taste and adjust seasonings (we usually add more), then add salt to taste. Original recipe says to add the rice mixture to the skillet and stir until onions are mixed well with the rice, but since our skillet isn’t big enough we combine everything in the casserole dish. 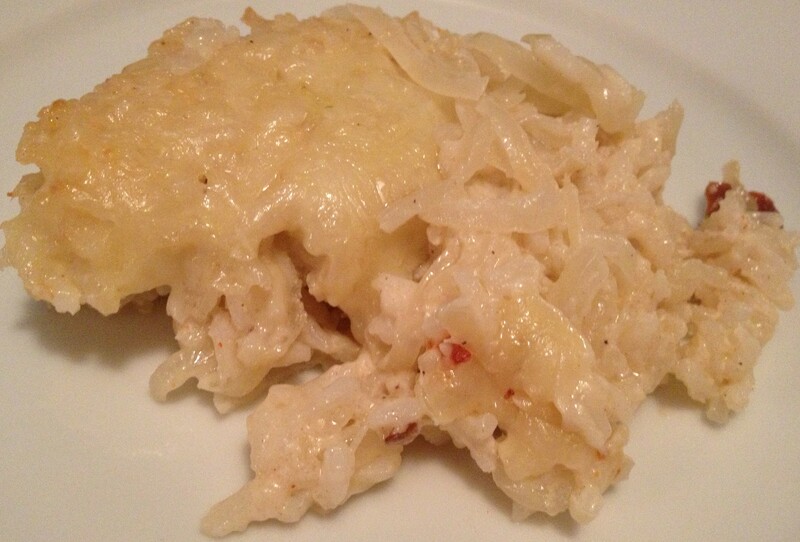 Top with the rest of the Gruyere cheese and bake for 30 minutes uncovered or until brown and bubbling. Serve topped with cilantro, it’s worth it. It’s no secret I don’t love sour cream. It’s a mouth feel thing. But in this dish, it combines wonderfully with the chipotle chiles and cheese. Plus, this dish freezes well and is perfect for a night when neither J or I want to cook. Recently, I was lucky enough to be the recipient of a House Party Avocados from Mexico party. Instead of going the traditional route, we opted to use the party for one of Mizzou’s away games. 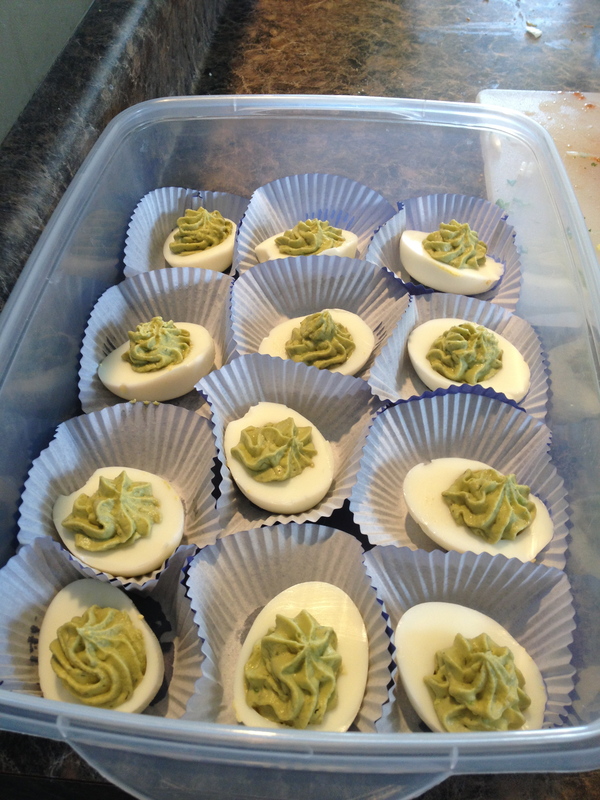 One of the most popular recipes of the day came from a dear friend, S, Avocado Deviled eggs. She got the original recipe from, All Recipes. Place the eggs into a saucepan in a single layer and fill with water to cover the eggs by 1 inch. Cover the saucepan and bring the water to a boil over high heat. Remove from the heat and let the eggs stand in the hot water for 15 minutes. Drain. Cool the eggs under cold running water. (Or feel free to use your favorite hard boiled egg technique!) Peel once cold. Halve the eggs lengthwise and scoop the yolks into a bowl.Add the avocado and sour cream to the egg yolks and mash into a smooth, creamy mixture. Stir in the Worcestershire sauce, dill, salt, and white pepper until the mixture is very well blended; spoon into the egg white halves (This is easier using a icing pipping bag or a ziplock bag with the corner snipped off!) and garnish with chopped green onion (if you’d like). While S left off the green onions, we could have easily added them, but they were delicious without. These are really good and hard to eat just one. Perfect for something a little different than the traditional deviled eggs. 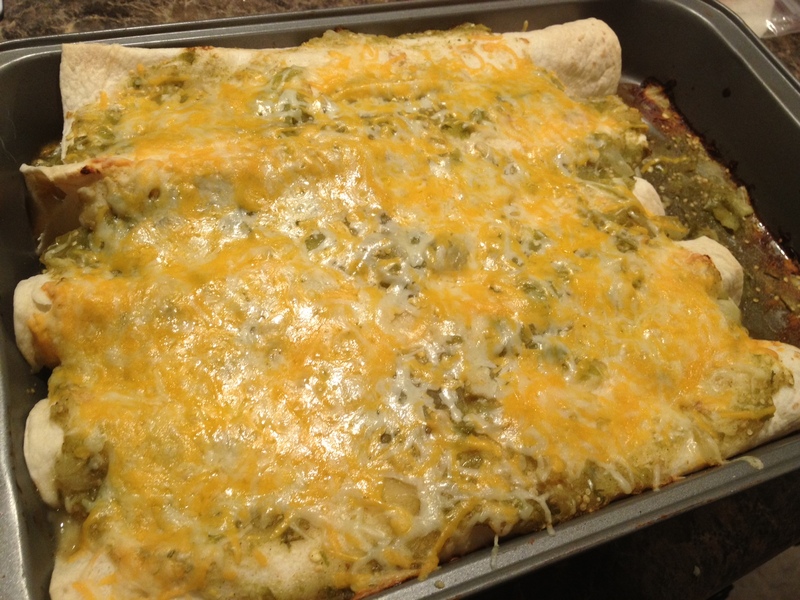 Using the tomatillo salsa recipe as a base, we made these amazing Green Chicken Enchiladas. While a bit time consuming, the recipe makes more than enough to freeze half and reheats very well. If you plan to freeze, just leave off the cheese! Preheat oven to 350 degrees. Roast chicken in the oven for 30 minutes at 350 degrees F, or until cooked though. Let cool and then shred. Set aside. For more flavor, season the chicken with salt, pepper and cumin prior to roasting. While the chicken is roasting, heat 2 tablespoons of olive oil in a medium saucepan over medium heat. Add the onion and cook until soft and caramelized , approximately 5 to 7 minutes. Add the garlic and cumin then cook for another minute. Sprinkle on the flour and stir to ensure the flour doesn’t burn. Gradually add the chicken stock. Continue stirring over a low simmer until the flour cooks and the liquid thickens. Turn off the heat, add 1/4 cup of the tomatillo salsa and some additional fresh chopped cilantro and fold in the shredded chicken meat. Season, to taste, with salt and pepper. To make the Enchiladas, take a large baking dish and smear the bottom with some of the reserved tomatillo salsa. Mix the salsa, cheese and the chicken mixture together in a bowl. Put a scoop of the shredded chicken-enchilada mix in an Enchilada. Fold the tortilla over the filling and roll to enclose it. Place the tortillas in the baking dish and continue to do the same with all eight tortillas. Finally pour the reserved enchilada sauce and top with the remaining shredded cheese. Bake uncovered for about 30 minutes until bubbly and cracked on top. Garnish with cilantro and tomato, sour cream and guacamole if desired. Perfect for a hot, summer evening. While this isn’t my most favorite dish, it is one of J’s most favorite dishes and he’s been searching for a good recipe for a while. He found this one from Big Oven ending the search. Extremely filling and comforting, with a few tweaks this is hands down the best Beef Stroganov recipe. Originally fearful of the nutmeg addition, it added a flavor depth that made the whole dish. Heat olive oil in pan. Coat sliced meat in flour and cook until brown. Add onion and cook for 5 minutes until slightly softened. Add garlic and cook until fragrant, about 1 minute. Add beef stock and bring to a boil. Add paprika, salt, pepper and nutmeg. Simmer until meat is tender, approximately an hour. Add mushrooms and sherry and simmer about 10 more minutes. Turn off stove and fold in sour cream. Let dish reheat gently and spoon over egg noodles. Garnish with fresh parsley. 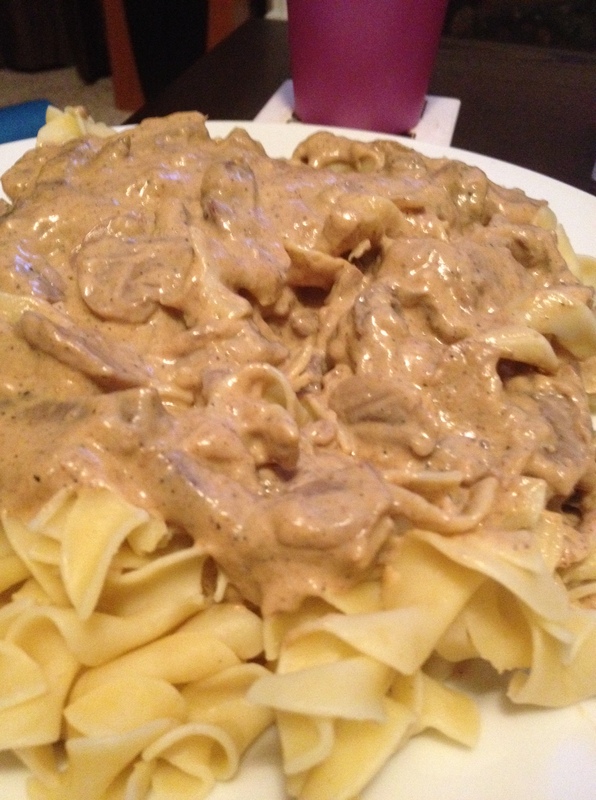 I usually find Beef Stroganov to be too heavy, too filling and too much everything. This dish isn’t too much of anything. It’s flavorful without being overwhelming.